Weddings are incredibly exciting at any time of the year but especially around Christmas time. The atmosphere at a Christmas Wedding is electric; your guests are already riding a wave of festive euphoria. 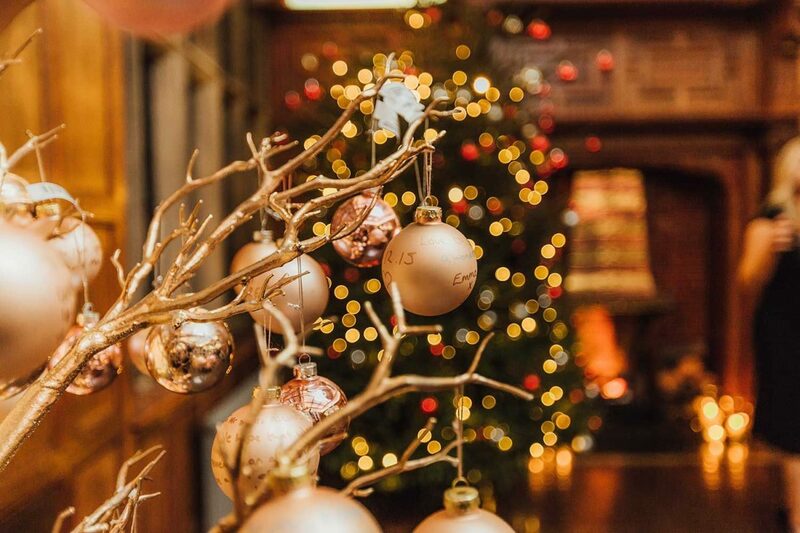 The venue is resplendent, dressed for Christmas, with an abundance of twinkly fairy lights and an impressively large Christmas Tree looking completely at home in the lavish oak panelled Entrance Hall. Why not let the magic of Christmas inspire your wedding drinks choices. Guests will welcome a warming glass of Winter Pimms or Mulled Wine, their heady fragrance is intoxicating and will instantly get guests in the mood for the day’s festivities. And let’s be honest nothing says Christmas Wedding like a glass of crisp, refreshingly tart champagne. I know some brides wonder whether a traditional turkey dinner might be one step too far at their wedding and arguably the closer your wedding is to Christmas the more likely it is that your loved ones may have already had a turkey dinner (or two!) at various Christmas parties; so it’s good to know we can offer a veritable smorgasbord of delicious winter dishes. From finest Beef Wellington to comforting Bangers and Mash, our creative catering options will not disappoint. One of the absolute best things about a Christmas Wedding is the cosy, intimate, incredible atmosphere created by all your guests being inside and enjoying the same space. Guests are far less likely to wander off exploring the gardens at a winter wedding which means you can control the flow of your day far more effectively than at a summer wedding. The dark nights mean that guests are up for hitting the dance floor way earlier than at a summer wedding too, perfect if you want to maximise the ‘party’ element of your big day. If you get one of the best Christmas presents imaginable this year, a proposal!!! !… then firstly please accept our massive congratulations, we hope you enjoy every breathtaking moment of your newly engaged status. Then once your feet have stopped dancing on the ceiling and your heartbeat has slowed long enough for you to start thinking about your wedding, we hope you get in touch. January is our busiest month for viewings; if you’d love a look around Pendrell Hall, get in touch and we’ll book you a viewing appointment as soon as possible! Our heartfelt congratulations to Louise and Ian who enjoyed a sensational Christmas Wedding at Pendrell Hall last year. Their joyous day was brimming with the Spirit of Christmas; it was a magical day full of love and happiness. Thanks to the divine Deborah Stott – one of our Dream Team photographers for these stunning pictures of their day and the devilishly handsome Ashmore Brothers Band who provided Dream Team entertainment for the day.